While it’s a funny video, it does highlight and lightly poke fun at how Anderson uses certain stylistic choices over and over again, enough for him to practically become his own genre of film. Personally, I adore most of his films for that very reason: they are so distinctly his that it’s impossible for anyone to replicate that style without calling back to how he did it first, and often better (I’d say the closest anyone has gotten to fully capturing that style is Paul King with the Paddington movies, but even the most positive reviews of those films refer back to the master of on-screen whimsy when describing their style). His thumbprints are figuratively and literally all over his latest film, the stop-motion epic Isle of Dogs which marks Anderson’s second foray into animation after Fantastic Mr. Fox (or third, if you count the several instances of stop-motion in The Life Aquatic with Steve Zissou), and it’s as delightfully quirky, funny and good-natured as you could expect from any of his films. Set in a dystopian near-future Japan, the corrupt Mayor Kobayashi (Kunichi Nomura) – a family member of an ancient cat-worshipping dynasty – has decreed that all of the nation’s dogs, who have fallen victim to a mysterious canine flu, are to be exiled to a remote island of nothing but garbage and rats to live out the rest of their days. Mere months after the expulsion, the island is completely inhabited by dogs, where one pack – which consists of snarling stray Chief (Bryan Cranston), fair-minded house pet Rex (Edward Norton), sports mascot Boss (Bill Murray), gossipy Duke (Jeff Goldblum) and former dog actor King (Bob Balaban) – come across an unusual sight: young Atari Kobayashi (Koyu Rankin), the adopted ward of Mayor Kobayashi, has travelled to the island via biplane to search for his beloved dog Spots (Liev Schreiber), who was the first canine to be transported there. The dogs accompany Atari on his mission throughout the island to locate and reunite with Spots, while back at home a much larger conspiracy is underway, which American foreign exchange student Tracy (Greta Gerwig) is keen to uncover for the world to see. All the familiar Anderson-isms are present and correct, from the on-screen title cards to characters addressing things to the audience to the non-linear timeline and so on, but unless you’re really not in this director’s line of work – which if that’s the case, why are you even watching this film in the first place? – then you’ll not only know to expect all of that, but it’s so well done and meticulously crafted that you honestly don’t care because it’s so delightful to watch. Anderson, who also wrote the screenplay and developed the story with Roman Coppola, Jason Schwartzman (who is oddly enough NOT in the movie as far as I know, despite being a regular in most of his films) and Kunichi Nomura, has created a vast and fascinating geography for this film that makes the adventure aspect of it thrilling and engrossing, and has given his characters that quirky spark of life which makes them fun and enjoyable to spend this amount of time with. Like with most of his films, there are small things in the background that are impossible to accumulate in one sitting, ensuring that repeat viewings will allow audiences to discover all new jokes and little tidbits they may have missed the first time, and if they’re as delightful as the things in the foreground then they will be quite the special little Easter eggs. Though this is most certainly a Wes Anderson film, right from the very start to the moment it comes to a definitive close, credit too must go to the dozens of animators who have truly brought to life an absolutely beautiful piece of hand-constructed art. The stop-motion in this movie is seamless, right down to the little things like dogs’ fur blowing in the wind even when they’re just sitting still, or the tiniest tick crawling down the back of a tail, and you can tell that the people who helped put this thing together really harboured a passion for this story if the end results are this astonishing to look at. It’s a gorgeously shot movie as well, with colours burning bright from every direction, like in certain scenes set in a makeshift shelter made out of multi-coloured saké bottles which is just stunning to witness, and the lighting and framing being just as effective as any of Anderson’s regular live-action outings. It’s got charm, beauty, humour, fun characters, a grand sense of adventure, and of course the right amount of whimsy and quirkiness that only Wes Anderson could pull off. 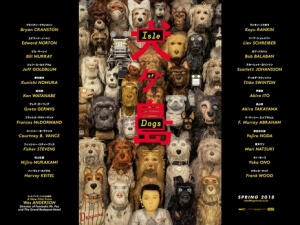 Unless Pixar delivers a sure-fire hit this year with Incredibles 2, then I would put good money on Isle of Dogs walking away with the Animated Feature Oscar next year, because not only do I believe right now that it is worthy, but because I kind of want to see how Wes Anderson accepts an Oscar – fingers crossed he gets Bill Murray to deliver it with a vinyl record playing a Rolling Stones song in the background while he just smokes in the background. Now THAT would be a historic Oscar moment! Isle of Dogs is another delightful addition to Wes Anderson’s unique filmography, featuring his usual quirky tropes against a beautifully animated backdrop with fun characters, strong humour, and a sweet-natured heart that’s impossible to resist. It’s a real doggie treat of a movie.